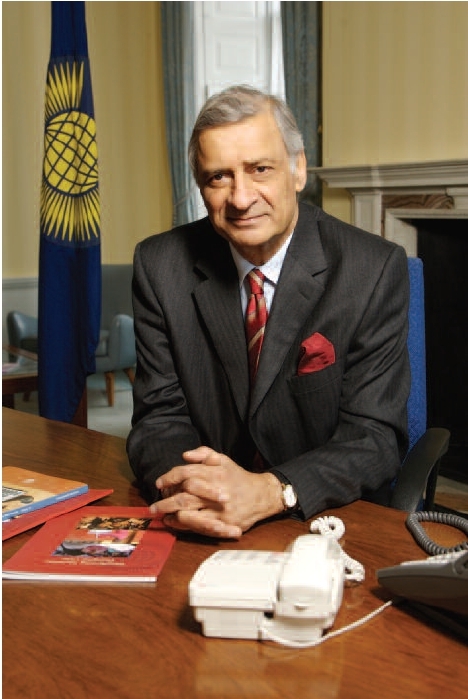 Our collective Commonwealth approach to health is set out in the new Charter of the Commonwealth, adopted by Heads of Government, and signed by Her Majesty Queen Elizabeth II, Head of the Commonwealth, on Commonwealth Day 2013 at Marlborough House, London. We recognise the necessity of access to affordable health care, education, clean drinking water, sanitation and housing for all citizens and emphasise the importance of promoting health and well-being in combating communicable and non-communicable diseases.We recognise the right of everyone to have access to safe, sufficient and nutritious food, consistent with the progressive realisation of the right to adequate food in the context of national food security. It is significant that health care is linked to public health priorities such as the supply of clean drinking water, good nutrition, sanitation and housing conditions, and to education. By setting health within this wider context we emphasise our holistic approach to advancing development, a primary goal of the Commonwealth family, together with democracy and respect for diversity. Likewise, social and economic inclusion are distinctive Commonwealth themes, and access to timely and affordable health care provision is a critical and determining factor in the ability of citizens to participate, to contribute, and to fulfil their potential. Opportunities for convening communities of practice in the sphere of health will be greatly enhanced through the new health hub currently being planned on the Commonwealth web platform ‘Commonwealth Connects’. With a working title of ‘Common Health’ we see this professionally managed, secure online environment for experts and practitioners as a convergence point for forging and nurturing pan-Commonwealth strategic partnerships, and a central access point for governments, civil society and private stakeholders to access knowledge and best practices, and to transact. Commonwealth health partnerships, as this publication shows, help advance an integrated and collective view. By bringing together a wide range of practitioners responsible for providing health care in diverse circumstances and widely varied locations, we all gain in understanding of how to take preventative action and deliver effective treatments safely and efficiently. Our annual Commonwealth Health Ministers Meetings have, over recent years, tackled communicable diseases and noncommunicable diseases. This year, the focus will be on mental health. The cumulative wisdom and knowledge acquired through our continuing dialogue and engagement helps our member states as we harmonise shared Commonwealth insights to the post-MDG (Millennium Development Goals) dialogue. We are making contributions of Commonwealth perspectives from various viewpoints: those of small states, of civil society, as well as the environment, youth, women’s, education and health ministers. These will leave their mark on the outcome of the new global development framework beyond 2015. It is in such ways that Commonwealth health partnerships contribute to the common weal, and to the greater global good.